This year Tom O'Brien, head coach of the N.C. State football team, showed students and fans why he deserves to be Coach of the Year. The Ohio native who came to State in December of 2006 has improved the football program every year since his inaugural season, including two bowl games in 2008 and 2010. 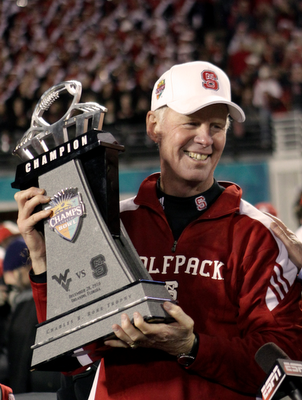 The 2010 season has been a special one for N.C. State's football program. After being picked to finish fourth in the Atlantic Division in the preseason, the Wolfpack finished tied for second, was one game away from playing for an ACC title and was the third league team picked in the bowl selections. Tom O'Brien's squad is the first Wolfpack squad to garner nine wins since 2003 and has posted State's first winning season in five years. With the Champs Sports Bowl victory over West Virginia, the 2010 squad tied the second highest win total in school history. The team finished 9-3 this year including its win over West Virginia at the Champ Sports Bowl. Tom O'Brien has coached his players to their best potential as can be noted with several favored NFL draft players, including one of the best quarterbacks N.C. State fans have seen in past decade, and MLB draft athlete Russell Wilson.